For those who are actively seeking loopholes in God's plan, the excuses they will use to dilute the importance of baptism are endless. After the thief on the cross, Cornelius is almost always their next favorite smokescreen. So what about Cornelius? Was he saved before baptism? Some time ago, a friend challenged me to explain why the Holy Spirit gave Cornelius the gift of speaking in tongues before he was baptized. (Acts 10) He was attempting to prove that Divine intervention indicates Cornelius was saved before baptism and, therefore, baptism is not essential to salvation. The following is a summary of my response. Let's look at each of these questions individually, and then combine the results in conclusion. 1. If Cornelius and his friends were saved before baptism, what did Christ circumcise during their baptism? It should be noted that Peter insisted on Cornelius and the others being baptized even after the miraculous sign was witnessed by all. Why? If their baptisms were only intended to be a formality that showed they were already saved ("an outward sign of an inward grace'), wouldn't baptism seem a little anti-climactic? Perhaps an even bigger question is this - What would a purely symbolic baptism say about Jesus and His role in that baptism? Colossians 2:11-12 (NIV) "In him you were also circumcised with a circumcision not performed by human hands. Your whole self ruled by the flesh was put off when you were circumcised by Christ, having been buried with him in baptism, in which you were also raised with him through your faith in the working of God, who raised him from the dead." In Colossians 2:11-12, the Holy Spirit clearly teaches that baptism is the very point at which Jesus performs the Divine operation called circumcision. It is the very point at which He removes sin from the heart. When baptism is reduced to a level of symbolism, the Surgeon is reduced to the role of a Public Relations Manager. Jesus deserves more! If Cornelius was only being baptized as a post-salvation symbol, these very obvious questions arise - What good did a symbolic baptism accomplish given the fact that the Holy Spirit had already given such a dramatic validation with the gift of tongues? How could a symbolic baptism possibly top the reality of what the Holy Spirit had already done? Why would they even try to top the outward sign of the Spirit's miraculous intervention? I suggest that the only thing that can top an external miracle done for validation is an internal miracle done for salvation. Cornelius and his friends were baptized for the very same reason that all the folks were baptized on the opening day of the church, "for the remission of sins." (Acts 2:38, NKJV). Their healing (salvation) did not precede their surgery (baptism). Next time, we will examine the question, "Does Divine intervention always indicate salvation or can it simply indicate that God has employed someone or something through Divine validation?" Please join us then! 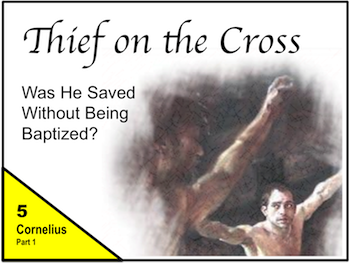 The Thief on the Cross: "Cornelius, Part 2"